At around this time every year I get homesick for Hungary and nostalgic about the dishes I regularly enjoy there. I get to daydreaming about lángos by Lake Balaton, salted goose cracklins (libatepertő) on toast for breakfast, mixed Vecsési pickles on the side of all classic meat-and-paprika dishes, my grandma’s chilled sour cherry soup… And, although I don’t typically have much of a sweet tooth, I even start to really miss Hungary’s fabulous pastry culture, constantly on display at Budapest’s century-old coffee houses and corner bakeries. On family trips to our house by the lake a member of the family was always sent to the local ice cream and pastry shop near the Balatonszéplak train station to pick up some sweet treats for after lunch. Each person was associated with a certain pastry. My choice was always between the following two. First, the krémes, about as classic as you can get, and truly delightful when made correctly. 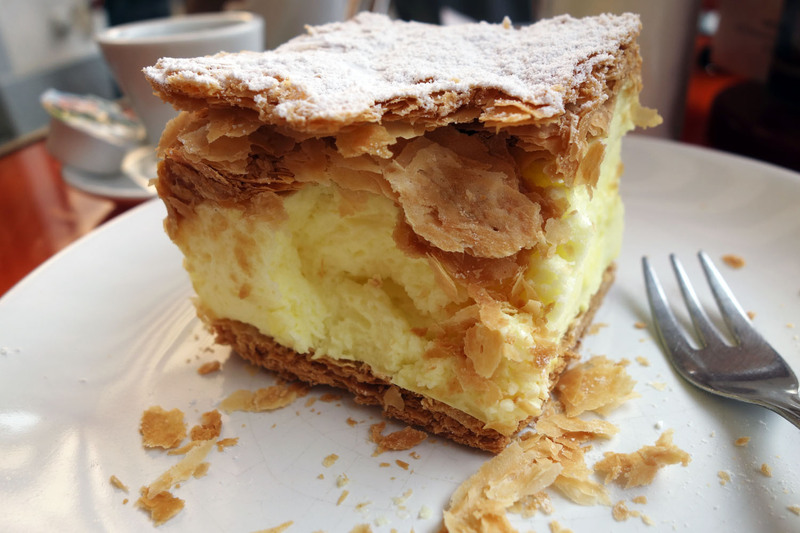 I had this one in Balatonfüred, but it’s easy to find at pretty much any bakery in Hungary. 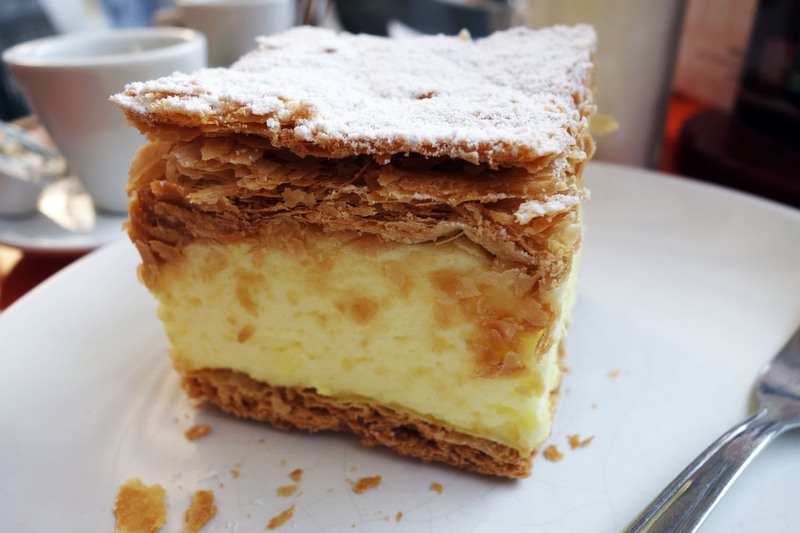 A creamy, yet airy and light, vanilla-flavored custard (made of milk and egg yolk) is stuck between a top and bottom layer of flaky pastry. The top is also sprinkled with powdered sugar. A fork glides effortlessly through the fluffy, frothy cream, shattering the brittle, toasted pastry into crunchy shards that offer perfect textural contrast. And because of the feather-light nature of this ethereal and not-too-sweet custard, the krémes is a good choice even during the hottest days of summertime. 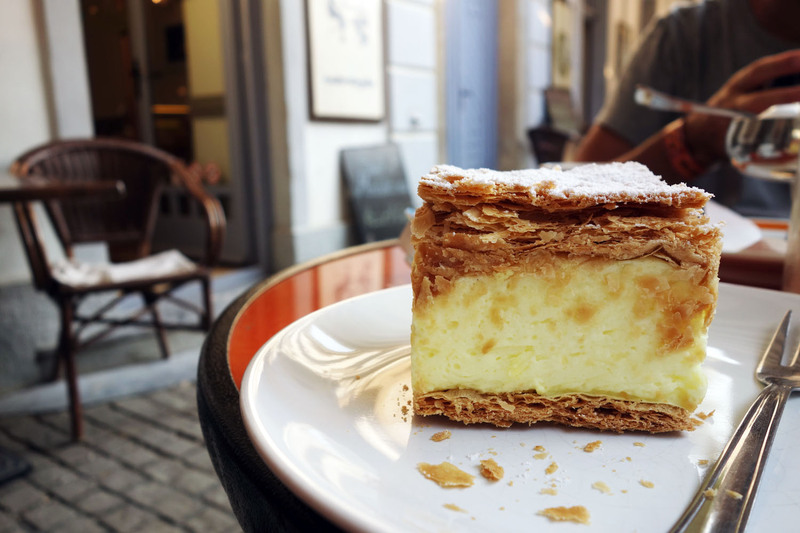 While the krémes is an everyday kind of pastry, there’s something truly special about the Esterházy szelet. 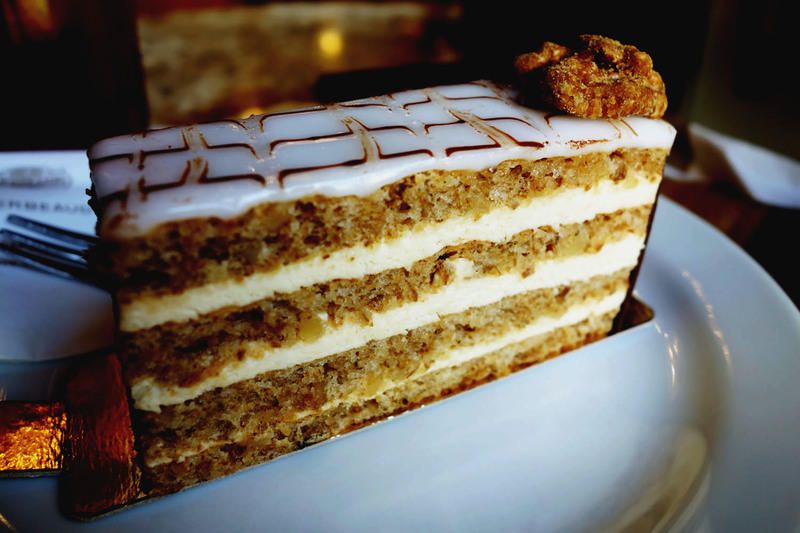 This one is best when purchased at a more reputable, old-school cafe like Cafe Gerbeaud (pictured above) or Szamos, right across the square from Cafe Gerbeaud and boasting equally talented pastry chefs. The Esterházy cake is built of three layers: good old-fashioned Hungarian pastry dough mixed up with ground walnuts, buttercream flavored with cognac and/or vanilla bean and topped with a layer of fondant decorated with chocolate cream etched on in a spiderweb pattern. The nutty, roasty-toasty caramelized flavor of the coarse dough is perfect with the smooth cream, and the fondant offers an extra bit of sweetness to round off each bite. 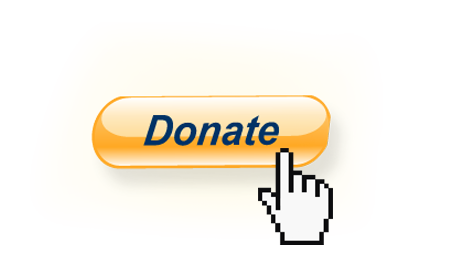 July 9, 2017 in HUNGARY.